The wrist and hand are composed of 27 bones: 8 bones of the wrist, 5 metacarpals and 14 bones of the phalanges. In this degenerative disorder, the articular cartilage wears away, exposing the bones. Cartilage is an elastic connective tissue whose purpose is to allow for a smooth, gliding motion between joints. Osteoarthritis is a disorder of the entire synovial joint organ and involves more structures than articular cartilage. The tissue changes that occur in the hand and wrist are a result of imbalance between catabolic and anabolic repair activity. Current evidence states that the subchondral bone may be the primary etiologic agent in osteoarthritis and joint cartilage is simply the final target of the process. Periarticular bone changes occur very early in the development of OA and these changes can be segregated into distinct patterns based on the anatomic location and pathogenic mechanisms. There is a progressive increase in subchondral plate thickness, alterations in the architecture of subchondral trabecular bone, formation of new bone at joint margins (osteophytes), and development of sub chondral bone cysts. Once the pathology reaches the articular cartilage, the cartilage thins and the joint space narrows. This causes sclerosis of the subchondral bone due to the new mechanical load placed on the affected joint. Pain, swelling and stiffness primarily targeted to DIP, PIP, thumb base, index and middle MCP joints. 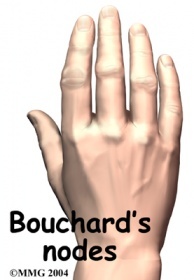 • Presence of Heberden (on distal IP joints) or Bouchard nodes (on proximal IP joints) or bony enlargements. • Diagnosis difficult to make due to the number of joints involved, the broad spectrum of severity and possible subsets of criteria which may exist. Use of radiographs is the form of imaging most seen clinically. • Laboratory markers such as rheumatoid factor (RF) and erythrocyte sedimentation rate (ESR). Blood tests are not required but recommended to exclude potential coexisting diseases. 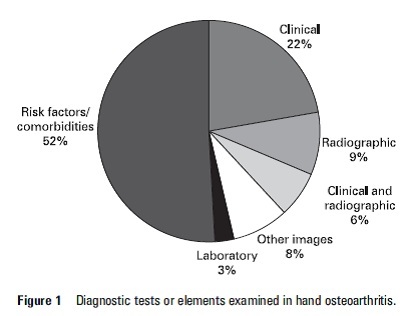 The diagnosis of hand and wrist osteoarthritis is based upon a combination of findings from the clinical manifestations, radiographic changes and laboratory tests, rather than a single criterion. • Zhang W, Doherty M, Leeb BF, et al. EULAR evidence-based recommendations for the diagnosis of hand osteoarthritis: report of a task force of ESCISIT. Ann Rheum Dis. 2009; 68:8-17. • Valdes K, Marik T. A systematic review of conservative interventions for osteoarthritis of the hand. Journal of Hand Therapy. 2010; 23: 334–351. • Walker MJ. Manual Physical Therapy Examination and Intervention of a Patient with Radial Wrist Pain: A Case Report. Journal of Orthopaedic and Sports Physical Therapy. 2004; 34 (12): 761-769. Walker et al. (2004) used an impairment based manual physical therapy approach in which the intervention included manual physical therapy in the clinic and self-mobilizations as part of a home exercise program. This impairment based approach appears to be beneficial in the treatment of CMC joint dysfunction and lead to the expeditious resolution of pain and return to full activity. 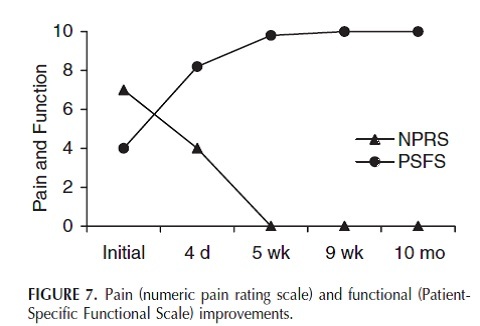 Results demonstrate the clinically significant differences on the PSFS and NPRS and can be seen on the diagram below. ↑ 1.0 1.1 Kaufmann RA, Logters TT, Verbruggen G, Windolf J, Goitz RJ. 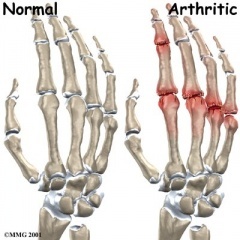 Osteoarthritis of the Distal Interphalangeal Joint. Journal of Hand Surgery. 2010; 35A: 2117-2125. ↑ 2.0 2.1 2.2 Goodman CC, Fuller KS. Pathology: implications for the physical therapist. Third Edition. St. Louis, MO: Saunders Elsevier; 2009. ↑ Kalichman L, Hernández-Molina G. Hand osteoarthritis: an epidemiological perspective. Seminars in Arthritis and Rheumatism. 2010; 39:465-476. ↑ 4.0 4.1 4.2 4.3 4.4 4.5 Zhang W, Doherty M, Leeb BF, et al. EULAR evidence-based recommendations for the diagnosis of hand osteoarthritis: report of a task force of ESCISIT. Annals of Rheumatic Diseases. 2009; 68:8-17. ↑ 5.0 5.1 Feydy A, Pluot E, Guerini H, Drape JL. Role of imaging in spine, hand, and wrist osteoarthritis. 2009; 605-649. ↑ Goldring SR. The role of bone in osteoarthritis pathogenesis. Rheumatic Disease Clinics of North America. 2008; 34: 561–571. ↑ Altman, RD. 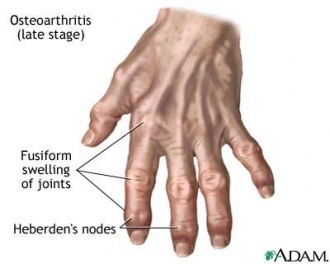 Classification of disease: osteoarthritis. Seminars in Arthritis and Rheumatism. 1991; 20(6): 40-47. ↑ Maheu E, Berenbaum F. Time for new outcome measures in hand osteoarthritis? Nature Clinical Practice Rheumatology. 2009; 5: 136-138. ↑ Valdes K, Marik T. A systematic review of conservative interventions for osteoarthritis of the hand. Journal of Hand Therapy. 2010; 23: 334–351. ↑ Talwalkar SC, Hayton MJ, Stanley JK. 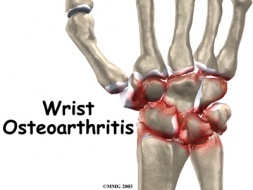 Wrist osteoarthritis. Scandinavian Journal of Surgery. 2008; 97: 305–309. ↑ Walker MJ. Manual Physical Therapy Examination and Intervention of a Patient with Radial Wrist Pain: A Case Report. Journal of Orthopaedic and Sports Physical Therapy. 2004; 34 (12): 761-769.